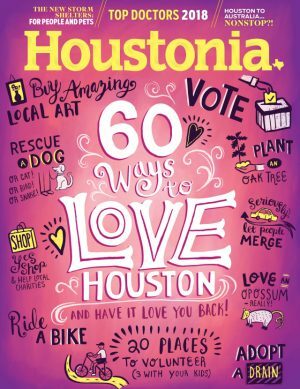 Chock-full of timely, engaging stories, as well as spectacular photography and cutting-edge design, Houstonia is unique: a news, entertainment and information source as smart, exciting and vital as the people who call Houston home. Each month we canvass the nation’s fourth largest city in search of the newsmakers and tastemakers, people who are changing the way we eat, play, dress and think. Our goal is a signature mix of in-depth news stories, provocative essays, and guides to the best of the city that no Houstonian can live without.